The BID’s vision is to create a successfully promoted, economically sound, safe, attractive and well-managed Town Centre for visitors, customers, businesses, employees and investors. 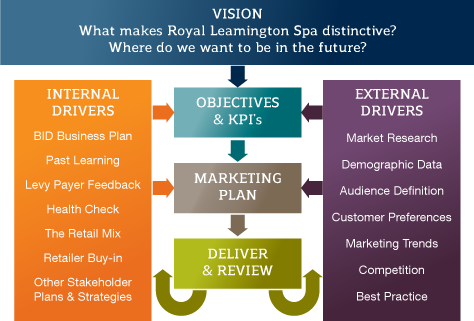 In order to deliver this vision and objectives, it’s necessary for BID to identify and understand Leamington’s current offering and how that offering can be improved for the future success of the town. 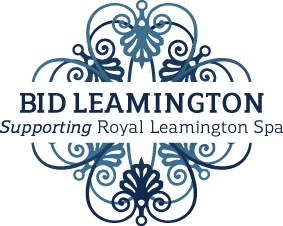 BID Leamington gathers this data through a number of Internal and External Drivers that help to set the BID’s Marketing Objectives which form part of the Marketing Plan and Key Performance Indicators (KPIs). Finance: To ensure efficient and transparent investment with measurable return on investment. Promoting: To attract visitors and our neighbours, and retain our local customers. Enhancing: To ensure a welcoming, interesting environment while building loyalty and fostering community spirit. Supporting: To deliver business support and efficiency savings. Partnerships: To work with our partners to achieve added value.